The infamous Christmas truce of 1914 was the first thing I ever knew about World War I. I don’t know if I learned of it in school or merely conversation; but I was six or seven years old and even at that age the story deeply moved me. I remember my mother told me how on one cold Christmas Day, the trenches went quiet and the sweet sound of carols replaced the cracks of gunfire. 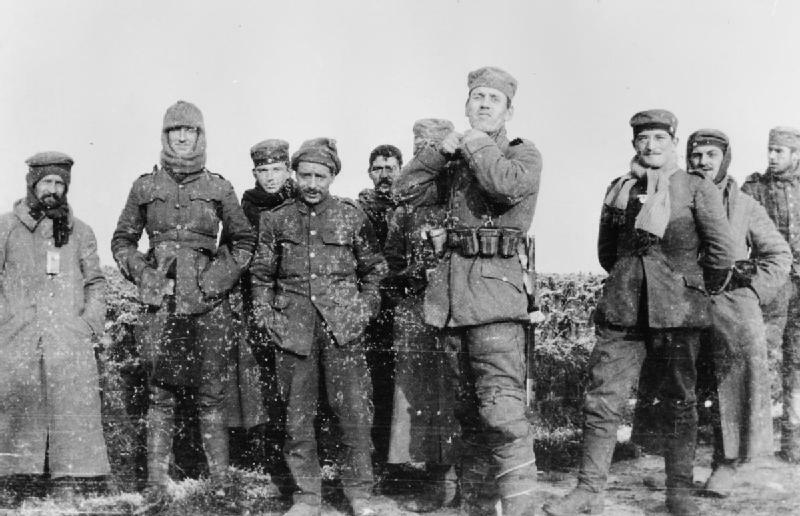 Hundreds of men from both sides left their positions to meet in No Man’s Land, and as they exchanged gifts and talked to one another, they spent Christmas in peace and brotherhood; as humans are meant to do. I always thought it was strange that, in the middle of a war, they would stop fighting and talk to each other. But as I grew older and thought about it more, I realized that it did make sense. 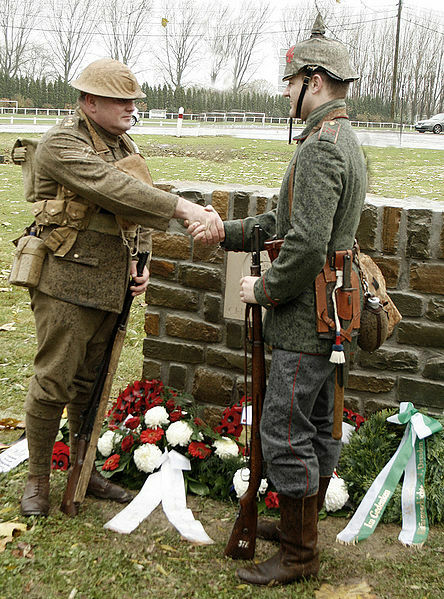 This Christmas truce, although short-lived, was earnest and beautiful and not a fluke. Yes, these men were enemies, or at least their respective states were. But, whether because of a recognition of brotherhood, discontentment at their lot, or a yearning for peace, Englishmen, Germans, Austrians, Frenchmen, and Russians laid down their guns and took up gifts and footballs instead. Now, at 20 years old and having learned much more about the world and this subject in particular, I believe that the Christmas truce of WWI demonstrates something intrinsic to the human soul. Although the truce was only a spark- extinguished after a few days by a blanket of artillery shells and mustard gas- that spark came from the compassion and unity that humans can feel and propagate. I don’t believe that the truce was entirely spontaneous or irrational. 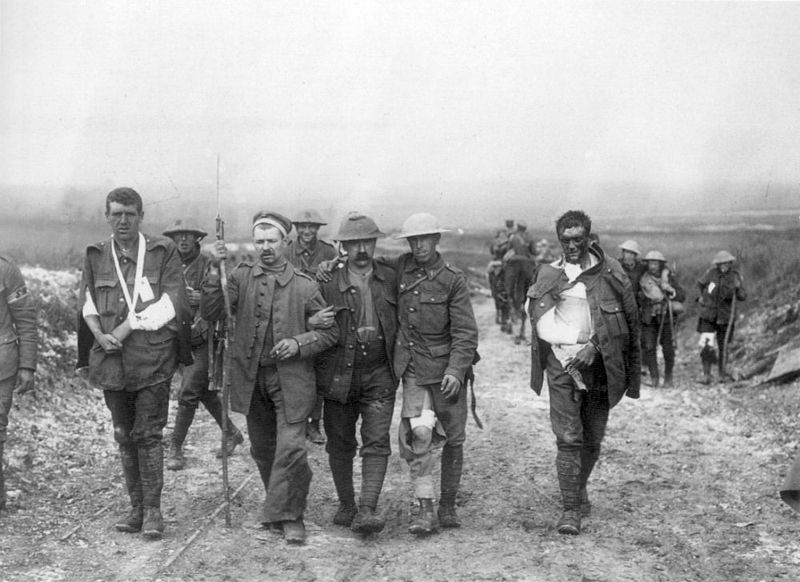 The soldiers involved had been in those hellish trenches for awhile by December, and had seen and dealt much killing. They must have been getting weary, and perhaps some wondered why they were really there in the first place. So when the sacred day of Christmas came along, with all its symbols of love, harmony, and peace, they were ready to be done with war- even for only a few hours. 1914 has now been gone for a century, and the Christmas truce could easily be viewed as a quaint, chivalrous ritual from an era long since dead. But human nature doesn’t change, and since the truce stemmed from its participants’ compassion and humanity, I believe the spirit of December 25, 1914 can still live today. One facet of human nature, unfortunately, is war. We have waged war on each other for thousands of years, and we aren’t slowing down. But equally, we humans possess understanding and goodwill. We also possess the responsibility to choose which part of our nature we will live by. Today in 2014, there are countless conflicts and disagreements in every corner of the globe. There are the obvious ones, such as the conflict between Hamas and Israel and the trouble between Russia and the West. There are also smaller ones, like border disputes which sometimes come to blows between Armenia and Azerbaijan, and Argentina’s ire at Britain regarding the Falkland Islands. Sometimes countries just don’t like one another, and sometimes that’s for good reason. But every single human lives in the world, not just a country, and we’re all more similar than it might be convenient to admit. I do believe that some wars are both just and necessary- but only when one or both sides are unwilling to concede anything and is bent on causing destruction and injustice on the other. World War II would be a good example; after all, Hitler was never going to give up his conquest for an Aryan empire until it was realized, and he was unwilling to negotiate in any way. Had the Allies not taken up arms, then Europe and perhaps more of the world would have been completely devoid of not only certain races, but of freedom itself. That said, I’m not sure all of today’s conflicts meet these criteria. Maybe, if we could remember the spirit of the Christmas truce one hundred years ago, some disagreements and even deaths could be averted. Even in a world that grows increasingly complex and cynical every day, I don’t think I’m naive; only hopeful. The human race has proved many times throughout history what it is capable of, both good and bad. Someday I hope for a world where peace and unity prevail, rather than the animosity and suspicion which we currently cling to all too often. And I do believe we can realize that world, even if it may seem as distant as the Christmas truce of 1914. We, as citizens of the world and members of one human race, need to decide what we really want to pursue. We can either continue punishing one another and growing farther and farther apart, or try to realize that we are all human and we all make mistakes. A discussion of human nature might seem simplistic when related to international affairs, but remember that a mere human runs every country, corporation, and organization in the world. Sometimes there is no bargaining with a person or a state. There comes a time when it is too late to avert war. And all parties involved need to make a commitment in order to create any kind of harmony, lasting or otherwise. It would have been a very different story from the fields of Belgium if one side had taken the other’s laxness as an opportunity to gain some ground. But in 1914, both sides acknowledged their similarities and stepped out to celebrate them. Why don’t we do the same today? Of course, Christmas is the optimal time to share this story. But kindness, compassion, and harmony can and should be spread any day of the year! Perhaps something like Christmas is necessary to remind us that we don’t have to remain shackled to the detrimental suspicions and attitudes of previous generations. 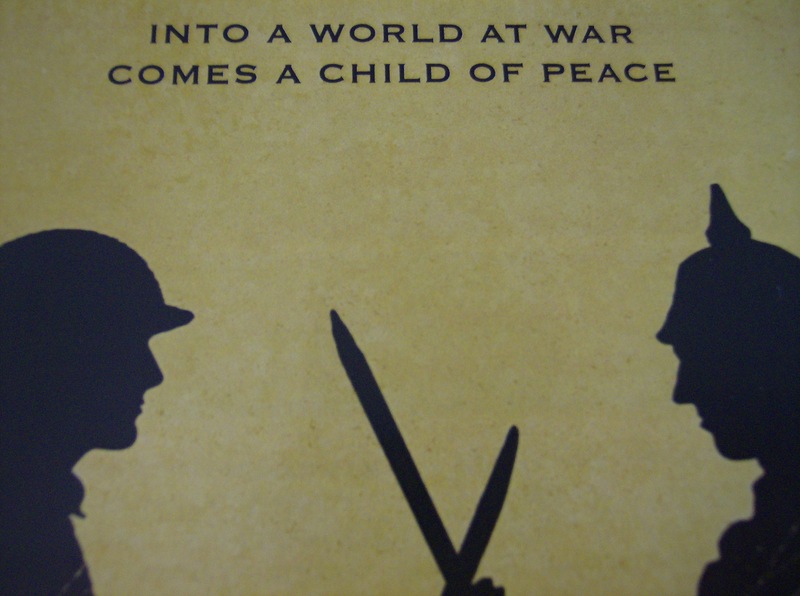 1914’s Christmas truce was a long time ago, but we can use it even today to influence our outlook and actions. The world is changing, so let’s make it a change for the best. Although there was an appalling snowstorm on Thursday, I managed to make it to the church, and it was lovely to see that the weather hadn’t discouraged too many other attendees. I settled into my seat with excitement, but I was uncertain of what to expect- I must say that I expected a great performance, but one without a lot of sophistication. Given that it was staged by volunteers and not by some fancy theatre company, it seemed reasonable to do so! But as soon as the actors of the first scene appeared, my surprise surfaced and only grew as the show went on. It was incredibly well done; and everything from the costumes to the music was amazing. The women in the cast were outfitted in a fantastic range of Mary Poppins-esque outfits; wearing button-up boots, elaborate hats, and elegant skirt-and-blouse combinations. The men were just as well-dressed, wearing classic outfits of tweed and pinstripes with scarves and newsboy caps. The music was also brilliant- and again, composed by a member of the church. Amazing! Every song was so catchy and I found myself wanting to sing along, even though I’m really not prone to such inclinations! The songs ranged from a rousing number sung by the women of the cast as they took up new roles once the men had left for Europe, to a deeply moving cry to heaven by a soldier upon the first blood of war. I love music, and this music was so memorable that it left a mark on my heart. As for the cast, they were wonderful. They were adept with the musical aspect and appeared as seasoned professionals, even though I know that one in particular (in a prominent role) had never done anything like this before. Each character was distinct, idiosyncratic, and lovable in their own way; and these characters got me invested in the plot. 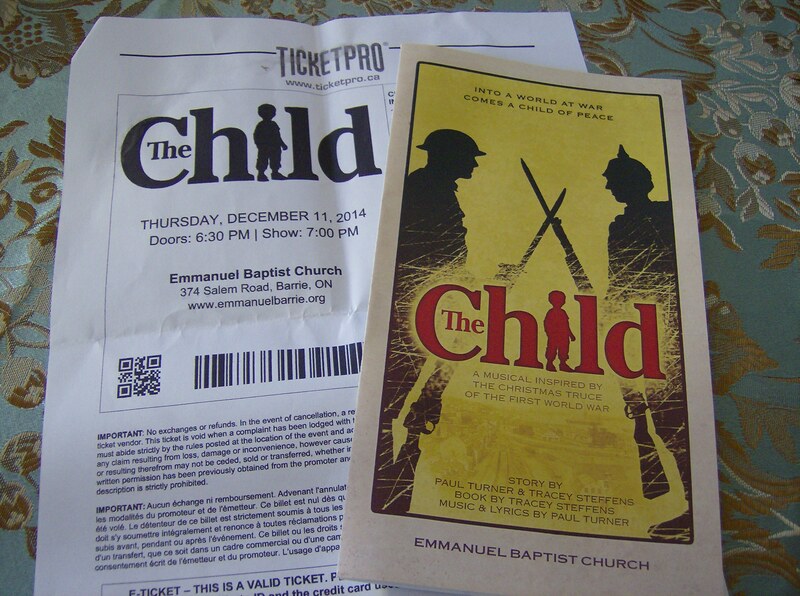 The fantastic music, atmospheric costumes, and talented cast and organizers all contributed to one crucial part of “The Child”: the beautiful story. I can’t describe it with any word other than “beautiful”. There were moments that were emotional, humorous, and even frightening- but the overall story was truly heart-warming, and exactly the kind of thing one needs to experience at Christmastime. As the title would suggest, this show centred around a child; or rather, two different children. One was Jesus- after all, this was a Christmas story. The other was the child of a young Irish Catholic woman and a Scottish Presbyterian, who married in secret. The Irish girl’s father was a proud Irishman; staunchly anti-Scot, he opposed the marriage, and much of the plot focused on her and her new husband’s struggle with her unreasonable and immovable father. The Christian faith was integral to the story; all the main characters belonged to one denomination or another, and on the Western Front, this had an effect on the soldiers just in time for Christmas and the famous Christmas truce. German soldiers initiated the truce by processing down the aisles to the stage- a nice touch which really brought the audience into the moment. They were singing “Silent Night” in German and carried a tiny evergreen tree with them, and it was incredibly moving to see the Canadians’ initial suspicion and hesitation melt away with the warmth of friendship. Another poignant moment came when the Germans and Canadians posed for a group photo- immediately mirrored by an authentic 1914 photo of the same event projected on either side of the stage. That moment made it very real for me. It was beautiful. The joy of Christmas- and the peace and reconciliation brought by this ancient gift- brought these soldiers together; and back in Halifax, the birth of another child brought more reconciliation. Upon the birth of his daughter’s firstborn, the stubborn old Irishman gave up his stubbornness, and made peace with her and her husband. It really was a lovely story, and a wonderful evening. I loved everything about it! The kind of peaceful contentment I got from watching “The Child” isn’t found often; but it stems from Christmas’s true foundation and the unimaginable love surrounding it. I’m so glad my friend invited me to this show- I think that it and it alone has already made this Christmas one to remember. Today, the world marks 100 years since the beginning of its first universal war. World War I began on July 28, 1914, after the invasion of Serbia by the Austro-Hungarian Empire. Due to my family history, WWI does hold some particular interest for me, but I don’t know a great deal about it. Seeing as 2014 is the centenary, I am trying to learn more about this tremendous war starting today. This post outlines my knowledge and observations of the war, and how it has affected me personally. I have Welsh heritage, and one of my Welsh ancestors fought in WWI. 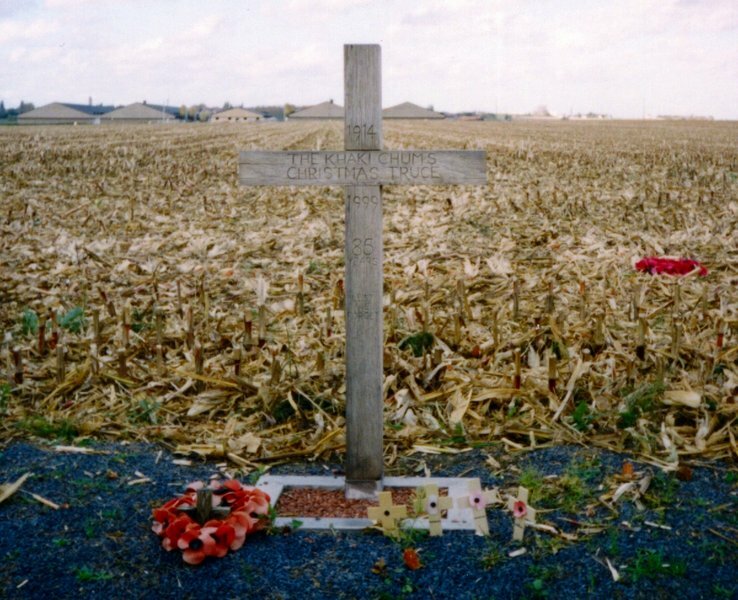 He was killed at the Battle of the Somme in France, and his death has given me a personal reason to appreciate and contemplate the terrible and enormous cost of the Great War. Growing up, I was always aware of stories of WWI; for example, I knew of Vimy Ridge and the fact that Canadian troops featured largely in the battle there. One of my first introductions to the actual conditions of the war came upon my first visit to the Imperial War Museum in London, where I visited the WWI Trench Experience. More about the Trench Experience can be read in my IWM London post here. The Second World War is my foremost military interest, so (unfortunately) on vacations and museum trips I tend to pay minimal attention to WWI stuff. However, when I traveled to the UK in 2011, one particular and unexpected WWI object caught my attention and had quite an effect on me. 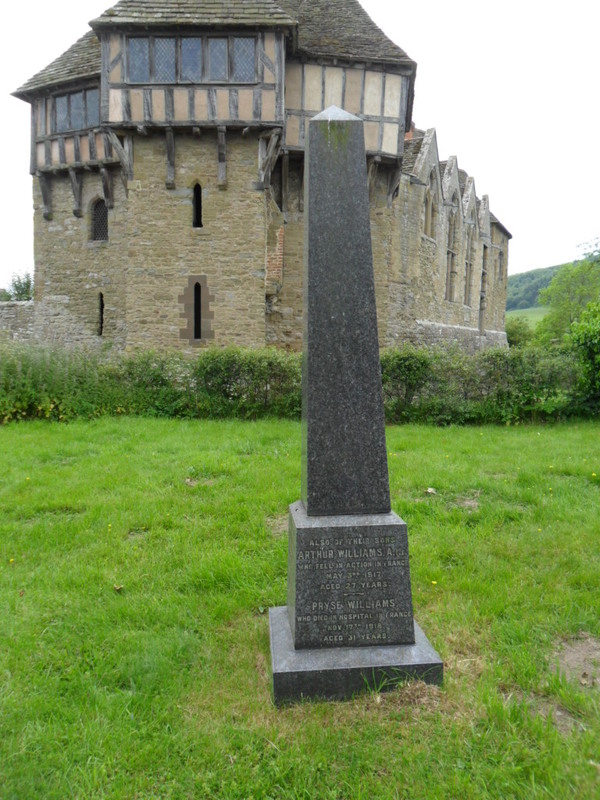 It was at Stokesay Castle in the western county of Shropshire, which was accessed through a churchyard. 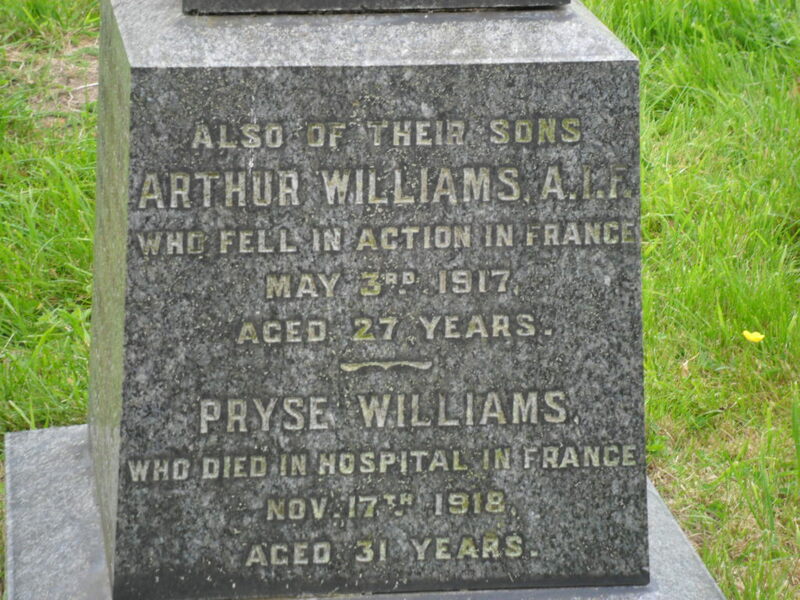 While walking through the churchyard, I was looking at all the surrounding gravestones, and noticed one which commemorated two brothers who had died while in France. It wasn’t as if I had never seen war graves before, but this one made me especially emotional. Maybe it was because I wasn’t expecting to see such a grave, or because it contained the remains of a family broken by war. I often think of that grave. 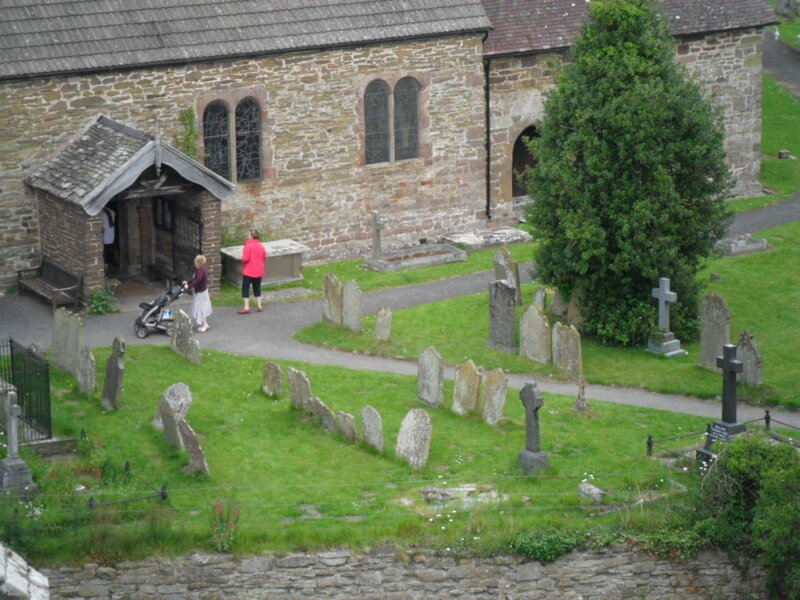 The churchyard at Stokesay. It’s likely- and tragic- that every tiny English churchyard holds at least one or two graves from WWI. Something which I feel is very evocative of WWI’s hugely scaled terror is the poetry of Wilfred Owen. 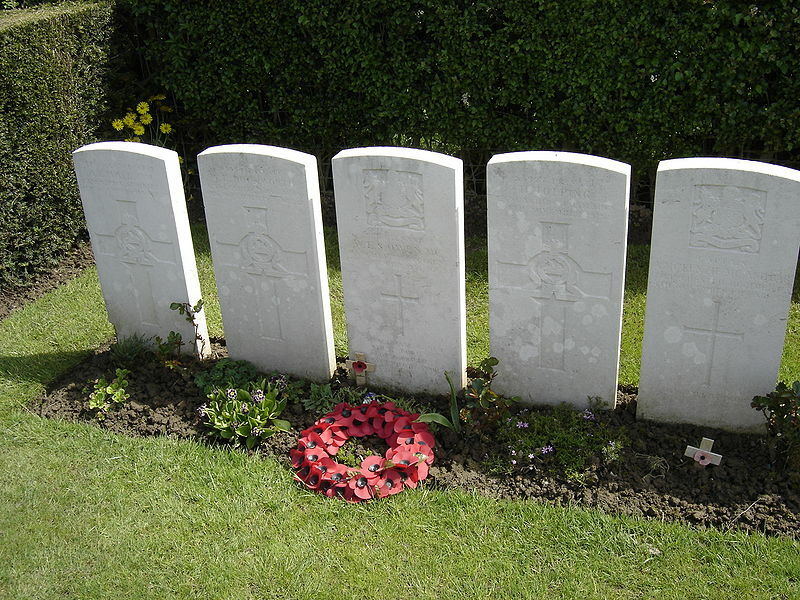 Owen was a soldier in the Manchester Regiment, and he died in France one week before the Armistice. But he was also a poet, and he wrote vivid accounts of the suffering, chaos, and senselessness which he saw everyday. His poems were very different from the prevailing contemporary tendency to glorify and romanticize war, and thus give a more realistic and personal look at WWI. I would really encourage you to read some of his work- particularly Anthem for Doomed Youth and Dulce et Decorum Est. When I think about WWI, I see a world that had no idea of the horror it was capable of creating. The naivety and excitement of the men going off to war in 1914 was soon shattered by machineguns and choked by mustard gas. It’s heartbreaking that World War I had such a cost, especially since it was fought to satisfy imperialistic greed and because its conclusion laid the foundation for the next World War twenty years later. However, I believe that its 9 million dead should be remembered and honoured regardless of the perhaps unfortunate and misguided causes of their leaders. I hope that 2014 and every year after will provide us with new reasons to commemorate something which we- although we have failed in this before- must strive to never repeat again.